Pastor Edward Rice was saved as a young man in Painted Post, New York where he grew up. He married Beverly and left the dairy farm to serve in the USAF in 1972. They had three boys as they served in the military for ten years. In 1982 he finished his Electrical Engineering degree at Ohio State University, via an Airman Education Commissioning Program, and was commissioned as a USAF officer pursuing a research and development career in classified programs. While moving around the USA in the military he was a youth pastor and associate pastor in Independent Baptist Churches near his station. In 1995 he became Captain Rice, USAF retired, and surrendered to be a Baptist Pastor. In 1998 he took the senior pastorate at Good Samaritan Baptist Church, in Dresden, New York where he has been pursuing his theological studies at Louisiana Baptist Theological Seminary. Pastor Rice received his second masters degree from LBU in 2013. 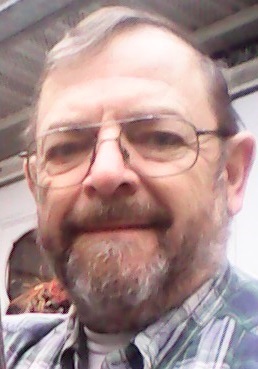 His son Michael is US Army retired living near Fort Hood Texas, Shane is an Independent Baptist Missionary pastoring Chiesa Biblica Battista, Mazara Del Vallo, Italy, and Matthew is serving our Lord Jesus Christ near Hamilton, NY. Capt Rice has spent seven years teaching math and science with the ABeka Christian High School Curriculum, and seven years teaching college math at community colleges near his church. From 13th Century BC "Linear B" Greek, through the "Classical Greek" of Homer in the 8th century BC, and Plato in the 4th century BC, right up to the Greek of the Bible, called "Koine Greek" or the common man's Greek, Greek is a marvelous form of language, capable of exact expression and subtle nuances. Christ came when the fullness of time was here (Gal 4:4), and the universal language used to capture and record and preach his arrival and the New Testament he came to offer, was Koine Greek. Every Christian can benefit from the study of this language. See how far we've come! It is recommended that you put this song on a 3x5 card and sing it every day for two weeks or a month, visually memorizing the Greek letters as you go. The main purpose of this study of Greek is to help you understand better the exceptional expertise and the almighty hand of God on fifty-seven translators of days gone by. Ergo the only English Bible trusted and used in this development is the Authorized King James Bible. It was translated by fifty-seven men who were divided into six companies which met in cities of Cambridge, Westminster, and Oxford, to take seven years, 1604 – 1611, to translate God's inerrant, infallible, verbally inspired Old Testament and New Testament books into an authorized Holy Bible which answered only to the original Hebrew and Greek.1 There was never before, and never since been assembled a group of more scholarly men with a more hallowed purpose. Modernist translators and modern Greek students give no reason whatsoever for anyone to ever say, “A better English translation is...” There is no better English translation. Remember the goal in these Greek studies is a clearer, more exact, and more persuasive understanding of what is miraculously preserved in English, a message of God's saving grace. In a day when the King James Bible is under continual attack by modern scholars armed with every type of criticism, higher, or lower, the learning of even a few Greek concepts will enhance your love for the King James Bible, your love for Old English, and your despise of the Greek critical text and its modernists English translations. One can rebuild a car engine with a wrench, a hammer and a crowbar, but to do the job right there are special tools, hones, and torque wrenches. Any serious student of the Word of God will find the study of Greek an excellent addition to his tool box for understanding the New Testament Scriptures, but more so finding a new appreciation of those fifty-seven ordained translators. 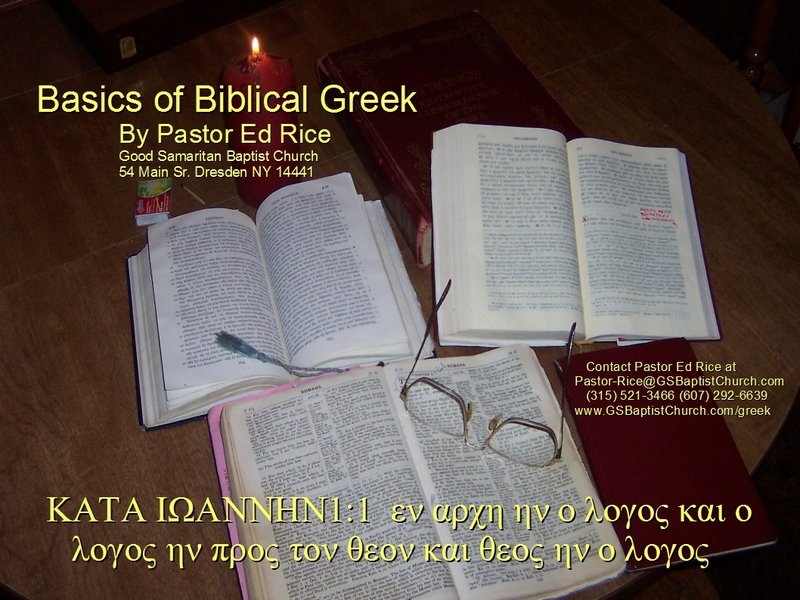 The Format of these Greek lessons will follow William D. Mounce's book "Basics of Biblical Greek" (Zondervan Publishing house @1993) It is recommended that the serious Greek student purchase the book and it's corresponding workbook, much of which is mimicked in these lessons. In these lessons the Chapter divisions referenced are from Mounce's book and the vocabulary lists are verbatim from his excellent work.